Kalimpong is one of the most amazingly beautiful places to visit for folks interested in floriculture, in watching birds and butterflies, rafting, trekking, paragliding or just plain lazing around! If you want an adrenalin rush…there’s rafting & paragliding. If you’re the outdoors kind….there’s trekking. And if you’re looking for a quiet time…listen to the whispers of nature. You can sit out in the mornings and evenings and meditate peacefully. Or just lay back, watch the clouds floating overhead, around you and sometimes even below you!! You’ll be surprised at what images, thoughts and smiles this simple act can conjure. Notice the birds, butterflies, insects, animals and flowers in the garden….. What’s more, we are a located within a beautiful flower nursery, with a heritage of its own. It is one of the oldest nurseries in Kalimpong still exporting flower bulbs & plants to USA, U.K. & Holland. Listen to music, have a beer, read a book, just relax. Most importantly breathe easy! Write anything...a poem…a story…a movie script…or even your memoirs! Paint a landscape ! When was the last time you flew a kite or sat around a log fire and sang songs ? Hear the whisper of the wind, the songs of birds singing in the early morn, the pitter-patter of the rain on a tin roof. There are times when you can ‘listen’ even to the ‘sounds of silence’! See a sunrise, a moonrise or a rainbow. It’s like watching Nature’s T.V….it takes away your troubles and cares. The pure mountain air cleanses your body and helps smooth out the wrinkles in your soul. Well…a friend came up with the word ‘Viewtiful’!! There are not many places here from where you can compose a photograph that includes the river Teesta and Mt. 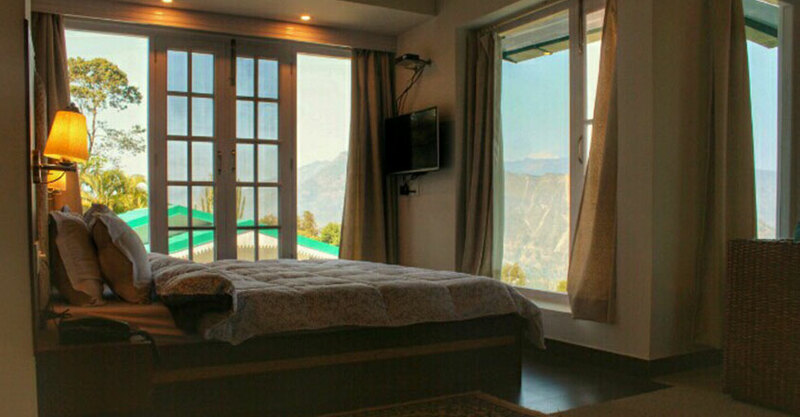 Kanchendzonga along with a panoramic view of the hills of Sikkim, undulating towards the mountains and the horizon. The subtle hues of green and blue as the layers of hills unfold before you, are like a landscape painting and one feels like a visitor in God’s Art Gallery. Night time across the hills looks like festival lights flickering away in the distance and sitting out in the late evenings or night with soft music around, brings about a calmness that totally relaxes you….a bottle of wine/whisky/beer enhances the experience.